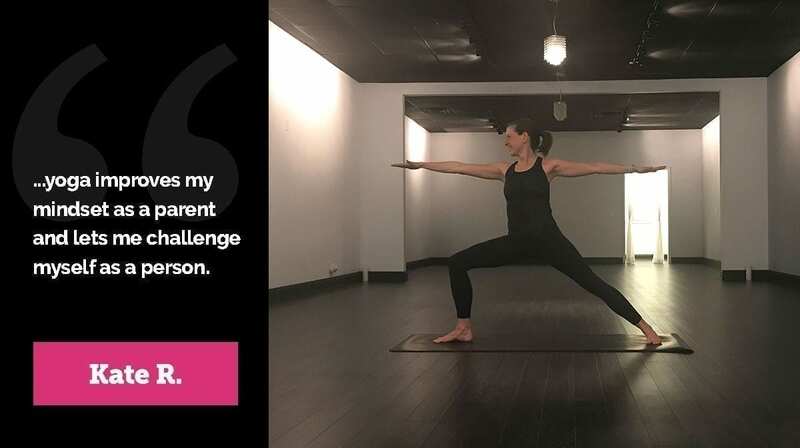 …yoga improves my mindset as a parent and let’s me challenge myself as a person. When Marina asked me if I would be the student of the month for January, I was equally flabbergasted and honored. I let that question sink in and understood that Marina was asking me to go outside my comfort zone, much like she does during her classes. Yoga was something I had been thinking about for years, but was not ready to make that commitment until recently. I am very goal-oriented and struggle with perfectionism. I like to be in control of all things, and I am super competitive. These parts of my personality originate from a childhood playing competitive sports, living up to high expectations and the “typical” pressures of a first born, and managing the effects of my parents’ messy divorce. I have spent most of my life trying to overcome obstacles, assert my strength and resilience, and succeed. Perfectionism is a difficult mindset to maintain, and a harder one to change. It took me years to even consider yoga because I was afraid to fail. For years, it seems like so much of my life was out of control and happening fast; I just could not add one more unknown. In the recent past, the unknowns of motherhood kept me busy enough. I had three boys in less than five years. I also am a high school English teacher and struggled to balance the demands of my job with sleepless nights, diapers, nursing, and trying to raise good humans. The emotional demands of these early years of motherhood left me exhausted; there wasn’t much left of me at the end of a day. I knew I had to get back into some sort of exercise routine to clear my head, give me some distance and perspective, and after years of giving everything of myself, make myself a priority. I thought about trying yoga in 2013 after my third son, but still wasn’t ready to leave my comfort zone, take a risk, and put myself out there. I can be shy and introverted at times, and going to a studio where I knew no one was just beyond my capability at the time. A few years back, I bought a road bike and started cycling. At the time, it seemed perfect. I enjoyed the freedom of the road, and the quiet time away from my loud life. As my kids grew and their schedules got busier, I needed to slow down and make my own health a priority. I also needed to learn how to let go of imperfections. However, it still took me awhile to get to yoga. I really believe people come into our lives for a reason. In 2015, my oldest son, Will, was a 2nd grader in Sheri Curry’s class. I hadn’t met Sheri yet, but heard she was a strong proponent of mindfulness. I was curious and asked her about yoga then, but didn’t really learn more until my second son, Mark, was in her class the following year. Mark really embraced mindfulness and frequently used the different breathing and refocusing techniques he learned in class to calm and center himself. He even signed up to do Sheri’s yoga class she taught at school. By then, Sheri and I were getting to know each other and at a school picnic, I made a commitment then to go with her to a yoga class. Sheri gave me the confidence in companionship my shy side needed to exit out of my comfort zone, get over the fear of trying something new, and be a yes. Sheri is really the beginning of my yoga journey. I started regularly accompanying Sheri to yoga in August, fittingly in between Baseball and Hockey seasons. Had it been a busier time of year, it may not have stuck. Between my three boys, we have five baseball teams, two of which are travel teams, (all of which my husband coaches), and 3 hockey teams, two of them travel. 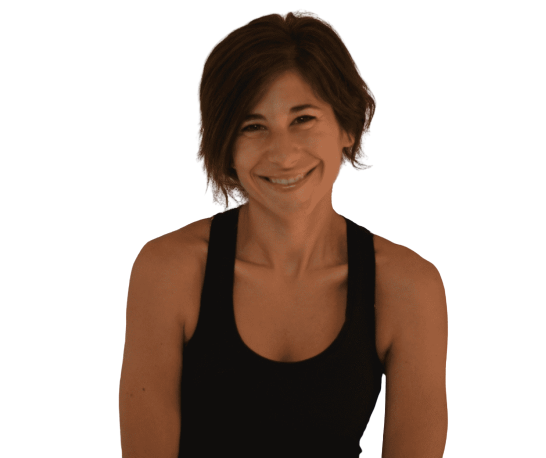 It would be easy to say there is no time for yoga, but even given the aforementioned schedule, in the last year and a half, I have only missed a handful of Marina’s Monday night classes. They have become a staple in our family schedule, along with the baseball field and hockey rink. My husband understands that yoga improves my mindset as a parent and lets me challenge myself as a person. Marina inspires me to keep working and has made a profound impact on my life. Her yoga class challenges my mental and physical toughness in ways nothing else ever has. I have to battle the competitive, perfectionist side of me every time I’m on the mat. I want to nail every pose, but have learned to be patient and to accept that my version of perfect does not have to be the same as anyone else’s. I also have learned that my best is good enough. Marina’s words “Be here now, now here” resonate with me not only during class but off the mat as well as a reminder to be present when life gets busy and hectic, to breathe, and take stock in all my blessings. Part of the reason I return every week is to hear Marina’s message. I try to really focus on being good enough. I have been so emotionally moved, that more than once, have totally let go and wept, right there on my mat. Yoga is my weekly reminder to just let it go. And if all that was not enough, let’s not undermine the physical benefits of yoga. My lifelong back and hip injuries have improved, as has my range of motion. Yoga has reduced trips to the chiropractor and PT. With every class, I feel myself pushing, improving, and learning something new. There are a few poses I really want to accomplish-there’s that competitiveness again-but I’m trying hard to give myself a break and know they will come with time and effort. In the meantime, this year, yoga rounded out my other training and made me a better athlete. 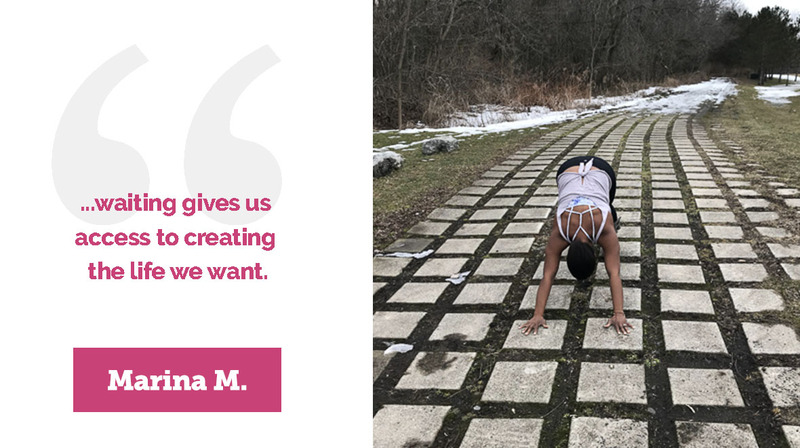 I only mention this because I know it would have been impossible without a consistent yoga practice; for the first time in my life, I was able to run long distances and completed two half-marathons, one full marathon, and two triathlons in 2018. As I approach a new decade, I feel strong and centered. I learned that there is no championship, or trophy, or accolade to “win” in yoga. It’s about being comfortable in the uncomfortable. It’s not a competition, and that’s why it’s hard, and that’s why I love it. What is Warrior II Pose About? This is a open hip pose that stretches your groin, thighs, and ankles. The resulting shape is a deep opening through the shoulders, arms, thighs, legs, and ankles. Watch Kate enter into this asana from Mountain Pose (Tadasana). She will exit the pose and land back in Mountain Pose (Tadasana) as well. Warrior II is transitioned into from from Warrior I (Virabhadrasana I). Come into Warrior I with your right leg forward to begin. Then open into Warrior II. Your hips will now face the side (rather than the front) and your stance should be wide. Your right knee should bend to stack evenly over your right ankle. Your right heel should be in line with the inner-arch of your left foot. Your left leg should be straight – keep your back knee loose but straight, in other words, you don’t want your knee joint to be locked or hyper extended. Your arms are outstretched from side to side like a wide T. Keep your shoulders back and down. Engage your core. Keep your tailbone dropping down. Spread all ten of your fingers wide and take your eye gaze over your front arm, as long as there isn’t discomfort in your neck. If there is discomfort in your neck, keep your eye gaze looking straight in front of you, rather than turning your head to the side. Hold this pose for 3-5 deep breaths. 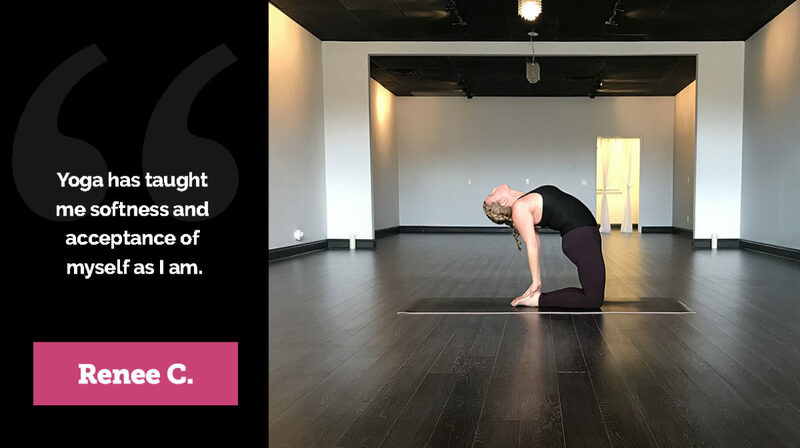 From here, it is most come to cartwheel the arms to the ground and go into a vinyasa flow from there (high plank, to low plank, upward facing dog, to downward facing dog). Don’t forget about the other side. Step into Warrior I on the other side with the opposite leg in front and transition into Warrior II following the same instructions above. Avoid this posture if you have high blood pressure, medical conditions that affect balance, diarrhea, or neck problems – keep your neck looking forward from the chest rather than over your front arm. Enlist the help of an experienced instructor with Peaceful Warrior Pose if this is your first time trying it.